Runlock Rope – What is it? Runlock rope is 100% braided polyester silk, is in essence two strands that run parallel to each other and then are braided at intervals to form loops. The loops which are braided along its entire length generate unlimited possibilities for you to use. 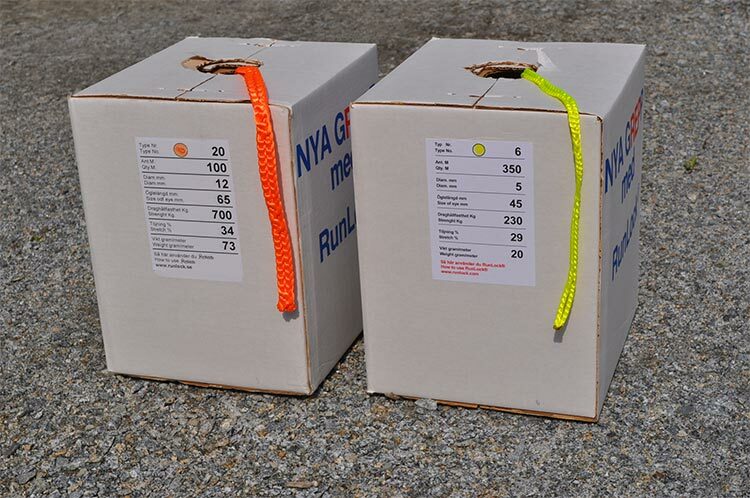 These are boxes of No.20 (left) and No.6 (right). Click the image to see a larger version and you will be able to see the specifications clearly. The best part about this rope system is you do no need to know how to tie any knots. The rope attaches to and through itself and to an object by making use of the integral braided loops. No knots to jam, come untied or come loose. Soft and pliable, this rope no-knot system has unlimited uses. Click here to see a diagram of the locks. Submit feedback and read what others have said about Runlock by clicking here. Visit our Runlock video series to see just how simple the Runlock system really is. Non-jamming and quick knots that anyone can learn in just minutes. Obviously, I am a hunter. Having taken many moose, elk and deer over the years, I have had opportunity to drag, or carry my fair share of game out of the woods. What I would have done to have a length of Runlock rope along with me? I won't be going without it now. Don't get me wrong, I can tie knots and lots of different ones too. Sometimes though, a knot will jam or slip even when applied correctly. This product just takes the process one step further, no slipping, no jamming, no cutting and best of all, a lock (it is called a lock, because it is not really a knot) is applied very, very fast. You may also be interested in the Runlock Hunting Set. A unique leash designed for a quick on/off release. 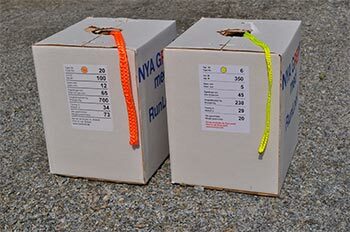 The Runlock rope set includes a 3.5 meter length of the No.16. Runlock No. 20 used to secure a game cart to a quad. 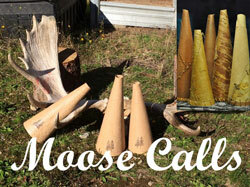 Useful for Deer Sized Game. 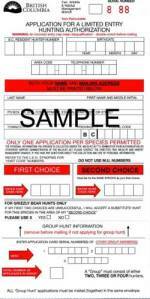 How many of you, along with a partner, or may solo have had the opportunity to drag a deer out of the woods? You each grab a side of the antlers and away you go. The first 50 yards or so go alright, but you are starting to get cramps in your hand. That's OK, you only have another 2 1/2 miles to go!! Ouch! Are you going to make it? How about the doe you shot, grab a handful of ear and away you go. That will be short lived! Dragging a doe by its ear over any distance is fatiguing to the hands and forearms. 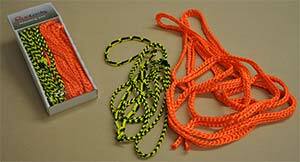 Picture this instead, you and your partner pull out your Runlock rope, make a slip knot in one end. Slip it over the antlers or head in the case of a doe. Create a fixed loop in the other end... one large enough to fit over your shoulder, and away you go. No more hand fatigue for you. Several hunters can lock their rope together and lend a hand. And remember, no knots to tie or jam. Sweet! 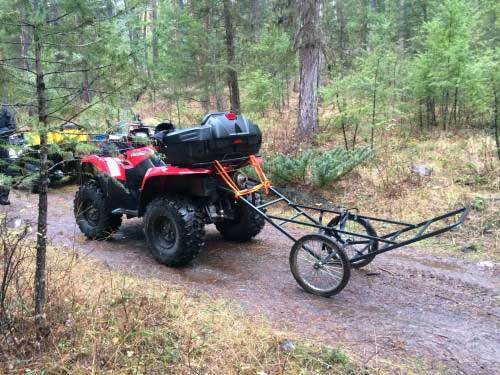 Using an ATV? That is awesome... use your Runlock to tie to the rear of your machine and pull the big game out of the woods. Runlock comes in various strengths, just pick the one that is right for you. Do you need a slip knot or a running loop, 2 seconds and it is done. Pull as hard as you want, the knot will not jam, and will not come undone. Of course breakage is always an issue, as it is with any rope or chain. We are all familiar with the saying, a chain is only as strong as its weakest link... well a rope is only as strong as its weakest knot. You cannot tie a knot in any rope, any time without some loss of strength, which is just a fact. The great thing about this system is, because the knots cannot jam the rope does not weaken significantly because of the knots. Of course we must never exceed the WLL (working load limit) of any rope. How many times have you wanted a loop in the end of a rope? One that can be easily untied after a load has been applied and then released. 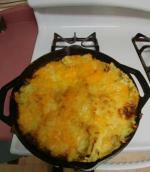 I know myself I have used screwdrivers and pry-bars and on occasion... a knife to remove knots. I am sure many of you reading this will be nodding you head in agreement. Would it not be nice to be able to make a loop of whatever size you want, and be able to untie it just as easily as it was tied? With Runlock rope you can do this! 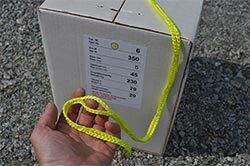 Another benefit of the Runlock rope system is once a splice is complete it does not increase the rope diameter by much. I called making a loop a splice because in a sense it is. Have a close look at the loop, it looks similar to a splice, yet only takes seconds to make. Who ever heard of making a rope splice in seconds? No one that I know can do this! At least not without using a Runlock product. 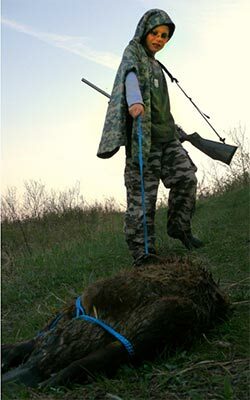 Meet Zach, a young Saskatchewan hunter with his first ever beaver harvested in Canada while out hunting with his dad! Zach is using a Runlock hunting set rope to get his beaver back to the truck. After he returns home, the beaver will be skinned and fleshed out. Once this task has been completed the skin will be stretched out on a drying board to cure. Congratulations Zach! Note how there are no knots used to tie the beaver. The simple use of the loops and locks are all that is required. So simple even a nine year old can use Runlock. Zach's Dad, Ryan tells me he likes this rope too! As a matter of fact has taken the rope with him on a spring bear hunt. We are waiting for him to return to post the pictures! 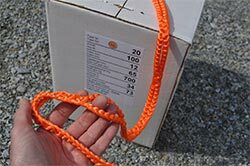 How about securing items on your ATV, Runlock rope has this ability too. Because it is made from polyester, it will stretch. You can tie your gear down with force and because of the stretching ability will maintain its tightness. Most of us have heard of the truckers knot (fixed lock quick release), this is an awesome knot that can be easily mastered by anyone using the Runlock rope. Look carefully at the pictures to see how easily this knot can be tied. If you are still having difficulty envisioning how to tie the truckers knot, watch the video. It is only a few minutes long and clearly shows how to secure this knot. Which by the way is also easily untied. Do you need to secure something? Use the cargo knot (cargo securing lock), this is another very simple knot. Similar to the truckers knot (fixed lock quick release) but with an extra crossover makes this knot somewhat stronger and more secure. Who Can Use Runlock Rope? This is the Runlock Hunting Set: It comes with 11.5 feet (3.5 meters) of No. 16 Runlock and the dog leash. 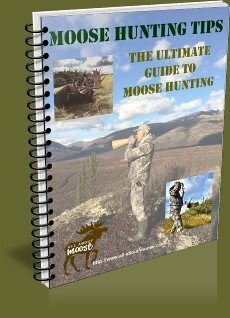 If you are convinced Runlock is a product you need to add to your moose hunting supplies, or hunting supplies in general. Then you have come to the right place. 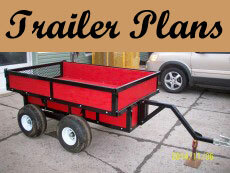 Please use the contact us form for quotations on lengths other than 30 feet. We would appreciate any feedback from the Runlock product users! If you have used the Runlock product, please tell us and your fellow outdoors-men about it! Show us your pictures of Runlock in action! Read what other sportsmen are saying about Runlock!